We chose to have Isaac dedicated as opposed to baptized and while the post will mainly transcribe his dedication, I'd like to take the time to explain the act of dedication. I haven't seen a blog post explore this topic or choice that I can remember, so I'm assuming there may be some misguided notions on what it is or is not. There may even be some hot buttons pushed, so I really hope that I am prepared enough to approach the subject. On that note, let me start with a sermon quote from Pastor Morris Vaagenes of North Heights Lutheran Church. On this particular Sunday, Pastor Morris began his message by proclaiming, "Today I will be preaching on that which all churches agree on when it comes to baptism." He stood silent at the pulpit for a moment or two, then turned to his seat without saying another word. While opinions can vary greatly, truth can always be established by turning to the Bible. In God's Word, baptism is linked with new birth or life, an inward cleansing, the washing away of sins, union with Christ, becoming part of the church and even salvation. While there are scriptures to support all of the above occurrences, there is no set blueprint or formula. Coupled with this it is recognized that several scholars have arrived at differing interpretations of the biblical texts. Due to this the church that Tony and I belong to allow the parents to decide whether to baptize or dedicate their child. Jesus was baptized as an adult. Jesus blessed children but never baptized them. All of the biblical examples of baptism were converts. Baptism is linked to repentance and faith. Our pastor provided great insight into the choices regarding dedication versus infant baptism and enlightened us to the fact that there is no example of infant baptism or for that matter a verse forbidding their baptism. Just one verse on either subject would have ended the debate before it began. His position is that the debate almost seems designed to keep those who have been baptized as infants from being lulled to complacency and that those who claim to have made a "decision for Jesus" could be cautioned from taking credit for God's salvation as opposed to His grace and our faith making it possible. We were lucky enough to have the dedication audio recorded and I would like to keep it for posterity. The below was given by Pastor Chris. Let me read a passage of scripture. This is out of Mark Chapter 10. People were bringing little children to Jesus to have him bless them, but the disciples rebuked them. When Jesus saw this, he was indignant. He said to them, "Let the little children come to me, and do not hinder them, for the kingdom of God belongs to such as these. Truly I tell you, anyone who will not receive the kingdom of God like a little child will never enter it." And he took the children in his arms, put his hands on them and blessed them. And that's what we're going to do today, as we dedicate Isaac. Before we ask Jesus to bless Isaac, which is what we're doing in command of the scripture we're going to pause to remember that godly parents and a loving church family are probably the most tangible source of blessing there is. So what we're going to do before we dedicate Isaac, we're going to dedicate ourselves. So I have some questions for you guys and they are not trick questions, as I promised. 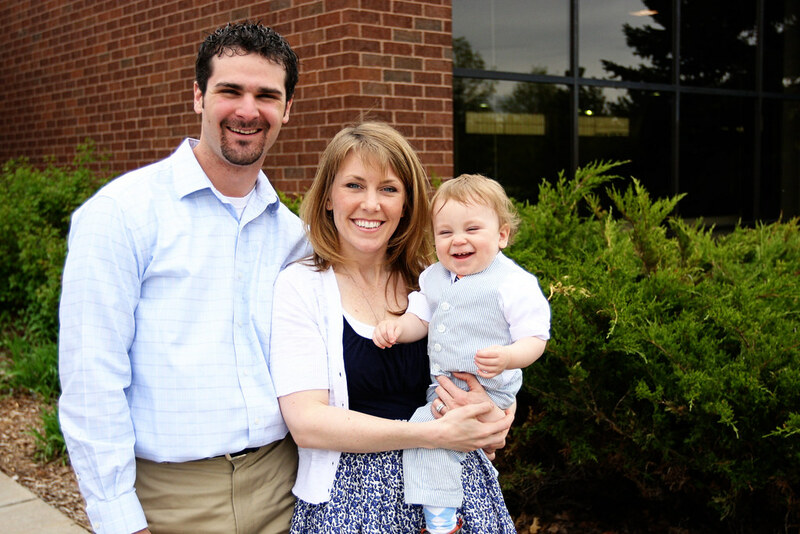 Tony and Leah, is it your intent to dedicate yourselves to the Christian nurture of Isaac? Will you pray for Isaac and with him? Will you faithfully involve him in the life of the church? Will you teach him to know and love God's word and set an example for him to follow? And will you as parents encourage Isaac to one day receive Jesus Christ as his personal Lord and Savior? And encourage Isaac to be baptized into the larger family of Christ? To which we responded: "We will with God's help." Now to us as a church body, we're in this together as well. As those who are in Christ, we are members of the same family and this means we are to both welcome Isaac and support his parents, including those times . . . when they need the extra support! So, as God's people will you make a commitment to pray for Isaac as God leads, to encourage him when God gives the opportunity, to be nice to him in the doughnut line, and set an example for him as you follow in the footsteps of Jesus? And as God's people, will you also make the commitment to pray for Tony and Leah as God leads, to encourage them as God gives the opportunity, to flash them an understanding smile when Isaac is having a meltdown, because we need those, and to set an example for them as you follow in the footsteps of Jesus? To which the congregation responded: "We will with God's help." All right, well Isaac. How're you doing? [Isaac is giving him the glare-down] You know what? Jesus wants to bless you. And so, we are going to anoint you with oil and follow the example of scripture and pray for your blessings. And then let's pray for him and his family. Father, we come to you and we ask that everything you want to do in this life will come to pass. We pray for your protection, that no weapon formed against him will ever prosper. We pray that your spirit will fill him from this point forward, if not earlier. Lord, that your spirit will stir in him. His name means laughter, Lord will his life bring joy to you. May his life bring joy to those around him, as you fulfill your plans and purposes in his life. Lord, we pray that one day he will understand consciously your great love for him, how deep and wide it is. Lord, we pray that he will discover the gifts that you have for him. Lord, we pray that he never has a day where he feels distant from you or from others who are called by your name. So Lord we ask that all of these things will come to pass in his life. 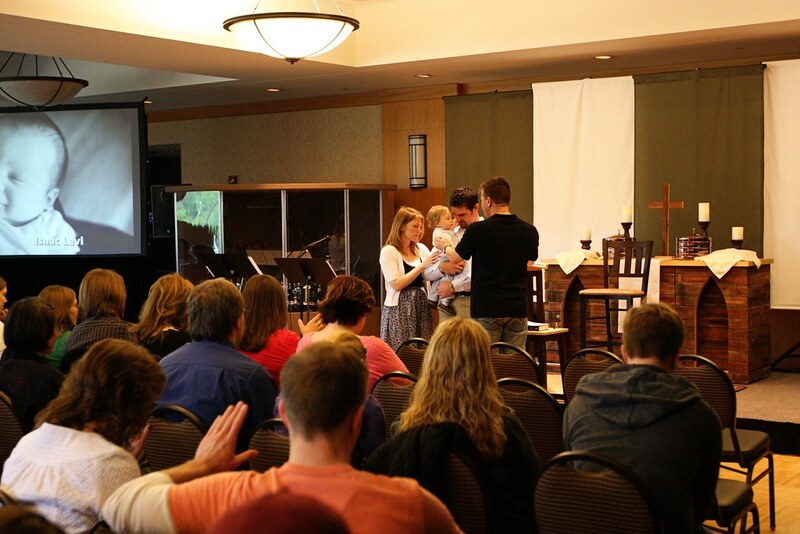 And we also pray for Tony and Leah, God that you will equip them as parents. Give them everything that they're going to need to be the parents that you want them to be. Lord, protect them and help us as a broader family to encourage and support this family. So Lord, we dedicate this life to you. He's your's Father. More than any other family, he first and foremost belongs to you. We ask for all of these things in your name, Amen. Congratulations to your family and may God bless Isaac! Beautiful, Leah. The picture of you guys praying as a family brought tears to my eyes. Great dedication. Love that Isaac gave you a high five! Those pictures are breath taking too! What a moment to capture! Love the bit about the high five too! Hilarious!! All of the reasons you listed are exactly why we dedicated Evy and are opposed to infant baptism. 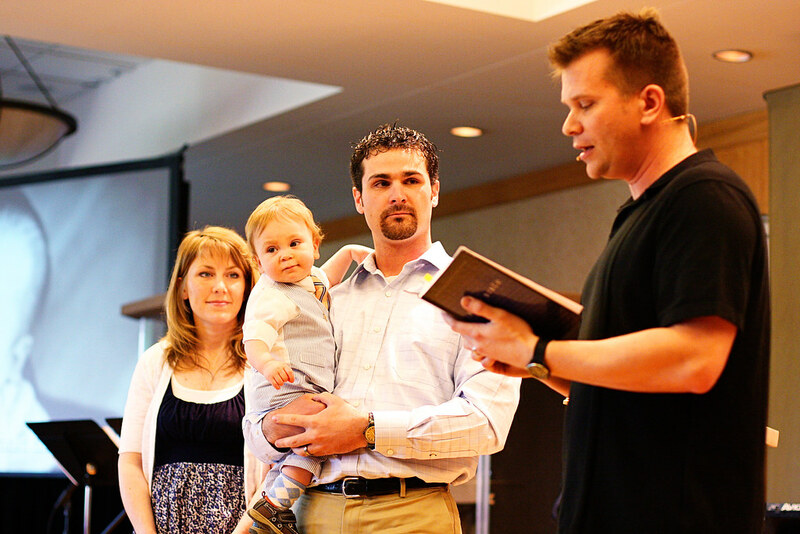 There are no Scriptures indicating an infant being baptized, but there are instances of dedication and adult baptism. I wrote about it when we dedicated Evy. I so admire you and Tony for claiming for household in Christ's name. Also, it's hard to present your views well on this issue; my two close friends feel very differently on the issue. What a beautiful time as a family! Such an interesting subject! We are trying to figure out what path we will take with this..I was baptized as an adult, Nate as a baby. Decisions, decisions. We believe the same way you do about baptism, and for the same reasons. My parents dedicated me when I was a baby, and I have forever loved their decision. Isaac can forever know that you have dedicated him to the Lord, and also know that alongside that he needs to make his own personal choice to follow God. Thank you for sharing this special moment in your lives. P.S. I teared up reading this. How very beautiful. And the high five seems very appropriate from Isaac! What a cutie. I have always thought that the baptism argument was a silly one. The bottom line is that whether we baptize as infants or adults is not a tenant of the Christian faith. Period. It's a matter of interpretation, and really doesn't matter. I believe that God knows our hearts, and the purpose of a baptism and confirmation is nearly the same as a dedication and subsequent baptism. Anyway...the photos are absolutely beautiful! 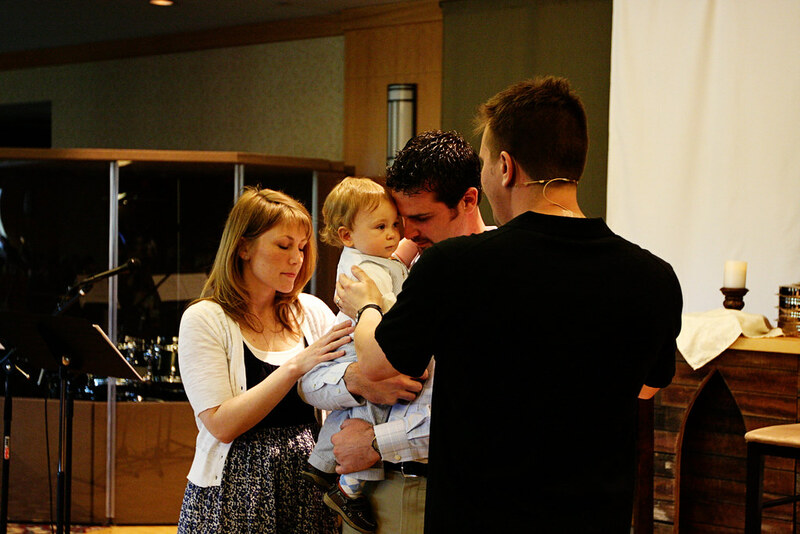 I share your thoughts on infant baptism vs dedication. You presented it so gracefully. Love it. And Isaac high fiving you during the prayer? PRICELESS! Thank you for sharing this :D I was dedicated and agree with all your points. Such a blessed day! What a wonderful sentiment! I've never heard about "dedications" but I really think it's a lovely idea! We battled with the idea of baptising Baby L within the Catholic church, and the latest round of controversies within the church, we decided to let her wait to decide what she wants to when she is older.